This article is about the principle of retributive justice. For other uses, see Eye for an eye (disambiguation) and Lex talionis (disambiguation). "An eye for an eye", "a tooth for a tooth" or the law of retaliation, is the principle that a person who has injured another person is to be penalized to a similar degree, and the person inflicting such punishment should be the injured party. In softer interpretations, it means the victim receives the [estimated] value of the injury in compensation. The intent behind the principle was to restrict compensation to the value of the loss. The principle is sometimes referred using the Latin term lex talionis or the law of talion. The English word talion (from the Latin talio) means a retaliation authorized by law, in which the punishment corresponds in kind and degree to the injury. The term lex talionis does not always and only refer to literal eye-for-an-eye codes of justice (see rather mirror punishment) but applies to the broader class of legal systems that specify formulate penalties for specific crimes, which are thought to be fitting in their severity. Some propose that this was at least in part intended to prevent excessive punishment at the hands of either an avenging private party or the state. The most common expression of lex talionis is "an eye for an eye", but other interpretations have been given as well. Legal codes following the principle of lex talionis have one thing in common: prescribed 'fitting' counter punishment for a felony. In the famous legal code written by Hammurabi, the principle of exact reciprocity is very clearly used. For example, if a person caused the death of another person, the killer would be put to death. The simplest example is the "eye for an eye" principle. In that case, the rule was that punishment must be exactly equal to the crime. Conversely, the twelve tables of Rome merely prescribed particular penalties for particular crimes. The Anglo-Saxon legal code substituted payment of wergild for direct retribution: a particular person's life had a fixed value, derived from his social position; any homicide was compensated by paying the appropriate wergild, regardless of intent. Under the British Common Law, successful plaintiffs were entitled to repayment equal to their loss (in monetary terms). In the modern tort law system, this has been extended to translate non-economic losses into money as well. The meaning of the principle Eye for an Eye is that a person who has been injured by another person returns the offending action to the originator in compensation, or that an authority does so on behalf of the injured person. The exact Latin (lex talionis) to English translation of this phrase is "The law of retaliation." The root principle of this law is to provide equitable retribution. Various ideas regarding the origins of lex talionis exist, but a common one is that it developed as early civilizations grew and a less well-established system for retribution of wrongs, feuds and vendettas, threatened the social fabric. Despite having been replaced with newer modes of legal theory, lex talionis systems served a critical purpose in the development of social systems—the establishment of a body whose purpose was to enact the retaliation and ensure that this was the only punishment. This body was the state in one of its earliest forms. The principle is found in Babylonian Law. If it is surmised that in societies not bound by the rule of law, if a person was hurt, then the injured person (or their relative) would take vengeful retribution on the person who caused the injury. The retribution might be worse than the crime, perhaps even death. Babylonian law put a limit on such actions, restricting the retribution to be no worse than the crime, as long as victim and offender occupied the same status in society. As with blasphemy or lèse-majesté (crimes against a god or a monarch), crimes against one's social betters were punished more severely. Roman law moved toward monetary compensation as a substitute for vengeance. In cases of assault, fixed penalties were set for various injuries, although talio was still permitted if one person broke another's limb. The principle was first referenced in the Code of Hammurabi, which predates the Hebrew bible. In the Hebrew Law, the "eye for eye" was to restrict compensation to the value of the loss. Thus, it might be better read 'only one eye for one eye'. The idiomatic biblical phrase "an eye for an eye" in Exodus and Leviticus (עין תחת עין, ayin tachat ayin) literally means 'an eye under/(in place of) an eye' while a slightly different phrase (עַיִן בְּעַיִן שֵׁן בְּשֵׁן, literally "eye for an eye; tooth for a tooth") is used in another passage (Deuteronomy) in the context of possible reciprocal court sentences for failed false witnesses. The passage in Leviticus states, "And a man who injures his countryman – as he has done, so it shall be done to him [namely,] fracture under/for fracture, eye under/for eye, tooth under/for tooth. Just as another person has received injury from him, so it will be given to him." (Lev. 24:19–21). For an example of תחת being used in its regular sense of under, see Lev. 22:27 "A bull, sheep or goat, when it is born shall remain under its mother, and from the eighth day..."
Isaac Kalimi explains that the "lex talionis was humanized by the Rabbis who interpreted "an eye for an eye" to mean reasonable pecuniary compensation. As in the case of the Babylonian 'lex talionis', ethical Judaism and humane Jewish jurisprudence replaces the peshat (literal meaning) of the written Torah. Pasachoff and Littman point to the reinterpretation of the lex talionis as an example of the ability of Pharisaic Judaism to "adapt to changing social and intellectual ideas." The Talmud interprets the verses referring to "an eye for an eye" and similar expressions as mandating monetary compensation in tort cases and argues against the interpretations by Sadducees that the Bible verses refer to physical retaliation in kind, using the argument that such an interpretation would be inapplicable to blind or eyeless offenders. Since the Torah requires that penalties be universally applicable, the phrase cannot be interpreted in this manner. The Oral Law explains, based upon the biblical verses, that the Bible mandates a sophisticated five-part monetary form of compensation, consisting of payment for "Damages, Pain, Medical Expenses, Incapacitation, and Mental Anguish" — which underlies many modern legal codes. Some rabbinic literature explains, moreover, that the expression, "An eye for an eye, etc." suggests that the perpetrator deserves to lose his own eye, but that biblical law treats him leniently. − Paraphrased from the Union of Orthodox Congregations. However, the Torah also discusses a form of direct reciprocal justice, where the phrase ayin tachat ayin makes another appearance. Here, the Torah discusses false witnesses who conspire to testify against another person. The Torah requires the court to "do to him as he had conspired to do to his brother". Assuming the fulfillment of certain technical criteria (such as the sentencing of the accused whose punishment was not yet executed), wherever it is possible to punish the conspirators with exactly the same punishment through which they had planned to harm their fellow, the court carries out this direct reciprocal justice (including when the punishment constitutes the death penalty). Otherwise, the offenders receive lashes. Since there is no form of punishment in the Torah that calls for the maiming of an offender (punitary amputation) there is no case where a conspiratorial false witness could possibly be punished by the court injuring to his eye, tooth, hand, or foot. There is one case where the Torah states "…and you shall cut off her hand…" The sages of the Talmud understood the literal meaning of this verse as referring to a case where the woman is attacking a man in potentially lethal manner. This verse teaches that, although one must intervene to save the victim, one may not kill a lethal attacker if it is possible to neutralize that attacker through non-lethal injury. Regardless, there is no verse that even appears to mandate injury to the eye, tooth, or foot. 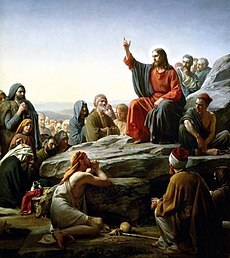 Numbers 35:9–30 discusses the only form of remotely reciprocal justice not carried out directly by the court, where, under very limited circumstances, someone found guilty of negligent manslaughter may be killed by a relative of the deceased who takes on the role of "redeemer of blood". In such cases, the court requires the guilty party to flee to a designated city of refuge. While the guilty party is there, the "redeemer of blood" may not kill him. If, however, the guilty party illegally forgoes his exile, the "redeemer of blood", as an accessory of the court, may kill the guilty party. Nevertheless, the provision of the "redeemer of blood" does not serve as true reciprocal justice, because the redeemer only acts to penalize a negligent killer who forgoes his exile. Furthermore, intentional killing does not parallel negligent killing and thus cannot serve directly as a reciprocal punishment for manslaughter, but as a penalty for escaping punishment. According to traditional Jewish Law, application of these laws requires the presence and maintenance of the biblically designated cities of refuge, as well as a conviction in an eligible court of 23 judges as delineated by the Torah and Talmud. The latter condition is also applicable for any capital punishment. These circumstances have not existed for approximately 2,000 years. The Talmud discusses the concept of justice as measure-for-measure retribution (middah k'neged middah) in the context of divinely implemented justice. Regarding reciprocal justice by court, however, the Torah states that punishments serve to remove dangerous elements from society ("…and you shall eliminate the evil from your midst") and to deter potential criminals from violating the law ("And the rest shall hear and be daunted, and they shall no longer commit anything like this evil deed in your midst"). Additionally, reciprocal justice in tort cases serves to compensate the victim (see above). The ideal of vengeance for the sake of assuaging the distress of the victim plays no role in the Torah's conception of court justice, as victims are cautioned against even hating or bearing a grudge against those who have harmed them. The Torah makes no distinction between whether the potential object of hatred or a grudge has been brought to justice, and all people are taught to love their fellow Israelites. In Exodus 21, as in the Code of Hammurabi, the concept of reciprocal justice seemingly applies to social equals; the statement of reciprocal justice "life for life, eye for eye, tooth for tooth, hand for hand, foot for foot, burn for burn, wound for wound, stripe for stripe" is followed by an example of a different law: if a slave-owner blinds the eye or knocks out the tooth of a slave, the slave is freed but the owner pays no other consequence. On the other hand, the slave would probably be put to death for the injury of the eye of the slave-owner. However the reciprocal justice applies across social boundaries: the "eye for eye" principle is directly followed by the proclamation "You are to have one law for the alien and the citizen." This shows a much more meaningful principle for social justice, in that the marginalized in society were given the same rights under the social structure. In this context, the reciprocal justice in an ideal functioning setting, according to Michael Coogan,[who?] "to prevent people from taking the law into their own hands and exacting disproportionate vengeance for offenses committed against them." When talking about an "eye for an eye", Jesus taught to turn the other cheek during the Sermon on the Mount. You have heard that it was said, "An eye for an eye and a tooth for a tooth." But I say to you, Do not resist the one who is evil. But if anyone slaps you on the right cheek, turn to him the other also. Some interpret this as an admonition not to seek legal steps for any compensation that corresponds in kind and degree to the injury. Others interpret it as Jesus simply teaching his followers not to take personal vengeance, rather than commenting on any legal practice. Christian interpretation of the Biblical passage has been heavily influenced by the Church father Augustine of Hippo. He already discussed in his Contra Faustum, Book XIX, the points of 'fulfilment or destruction' of the Jewish law. George Robinson characterizes the passage of Exodus ("an eye for an eye") as one of the "most controversial in the Bible". According to Robinson, some have pointed to this passage as evidence of the vengeful nature of justice in the Hebrew Bible. Similarly, Abraham Bloch speculates that the "lex talionis has been singled out as a classical example of biblical harshness." Harry S. Lewis points to Lamech, Gideon and Samson as Biblical heroes who were renowned for "their prowess in executing blood revenge upon their public and private enemies." Lewis asserts that this "right of 'wild' justice was gradually limited." Stephen Wylen asserts that the lex talionis is "proof of the unique value of each individual" and that it teaches "equality of all human beings for law." The Qur'an mentions the "eye for an eye" concept as being ordained for the Children of Israel. The principle of Lex talionis in Islam is Qiṣāṣ (Arabic: قصاص) as mentioned in Qur'an, 2:178 : "O you who have believed, prescribed for you is legal retribution (Qisas) for those murdered – the free for the free, the slave for the slave, and the female for the female. But whoever overlooks from his brother anything, then there should be a suitable follow-up and payment to him with good conduct. This is an alleviation from your Lord and a mercy. But whoever transgresses after that will have a painful punishment." Muslim countries that use Islamic Sharia law, such as Iran or Saudi Arabia, apply the "eye for an eye" rule literally. In the Torah We prescribed for them a life for a life, an eye for an eye, a nose for a nose, an ear for an ear, a tooth for a tooth, an equal wound for a wound: if anyone forgoes this out of charity, it will serve as atonement for his bad deeds. Those who do not judge according to what God has revealed are doing grave wrong. Martin Luther King, Jr. later used this phrase in the context of racial violence: "The old law of an eye for an eye leaves everyone blind." ^ a b Plaut 1981, p. 572. ^ a b c Plaut 1981, pp. 571ff. ^ Hammurabi & 1780 BC, §230. ^ Hammurabi & 1780 BC. ^ Bond, Kenneth (1998), Religious Beliefs as a Basis for Ethical Decision Making in the Workplace, Humboldt State University, archived from the original on 3 July 2007, retrieved 10 July 2010, ...Code of Hammurabi (1780 BC). I used a translation by LW King with Commentary by Charles F. Horne (1915). My version was a 1996 electronically enhanced version of the 1910 Encyclopædia Britannica. ^ "Roman law: Delict and contract", Encyclopædia Britannica . ^ Kalimi, Isaac; Haas, Peter J (2006). Biblical interpretation in Judaism and Christianity. Continuum. p. 2. ^ Pasachoff, Naomi E; Littman, Robert J (2005). A concise history of the Jewish people. Rowman & Littlefield. p. 64. ^ Bava Kamma, 83b–84a . ^ "Torah", About Judaism, ou.org . ^ a b Dt 19:19. ^ Hillel, "Rotze'ach u'Sh'mirat Nefesh", Nezikin, 1:7 . ^ a b Coogan, Michael D (2009). A Brief Introduction to the Old Testament: The Hebrew Bible in Its Context. New York: Oxford University Press. p. 112. ISBN 978-0-19-533272-8. ^ of Hippo, Augustine, "Contra Faustum", Fathers, NewAdvent . ^ Robinson, George (2000). Essential Judaism: a complete guide to beliefs, customs and rituals. Simon & Schuster. p. 242. ISBN 978-0-671-03481-8. ^ Bloch, Abraham P (1984). A book of Jewish ethical concepts: Biblical and postbiblical. KTAV. ^ Lewis, Harry Samuel (1915). Liberal Judaism and social service. Bloch. p. 37. ^ Wylen, Stephen M (2005). The seventy faces of Torah: the Jewish way of reading the Sacred Scriptures. Paulist Press. p. 20. ^ Qur'an, V: 45 . ^ Court orders Iranian man blinded, BBC, 28 November 2008 . ^ "Acid blinding sentence postponed by Iran after international outcry", The Guardian, UK, 14 May 2011 . ^ King, Martin Luther jr, King, Coretta Scott, ed., The Words, Violence as a way of achieving racial justice is both impractical and immoral. It is impractical because it is a descending spiral ending in destruction for all. The old law of an eye for an eye leaves everyone blind. It is immoral because it seeks to humiliate the opponent rather than win his understanding... .
Hammurabi, Code of 1780 BC . Plaut (1981), The Torah — A Modern Commentary, New York: Union of American Hebrew Congregations . Aquinas, Thomas, "Matthew 5:38–42", Catena (collation of commentaries) . Calvin, Jean, "21:22–26", Commentary on Exodus, Christian classics ethereal library . Miller, Professor William Ian, "The fine art of revenge", Salon (interview) : the author of "Eye for an Eye", about the Lex talionis. Shubow, Justin (December 2006), "Blind Justice", First Things (review of William Ian Miller's Eye for an Eye), archived from the original on 23 February 2008 . "The Torah and Lex Talionis", About Judaism (explanation), Union of Orthodox Jewish Congregations .